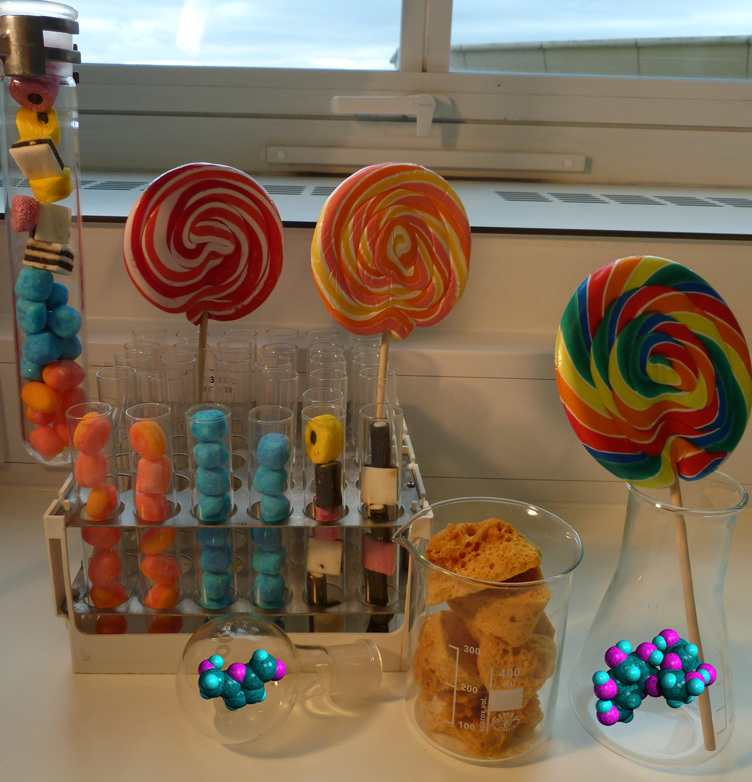 An assortment of sweets in some common laboratory glassware, with molecules of hydroxymethylfurfural (HMF, left in round-bottomed flask) and sucrose (right, in conical flask with lollipop). HMF is produced from carbohydrates (sugars) during caramelisation. Sweet temptation or dangerous addiction? In our second post on sugars, we look at the structures of carbohydrates and some of the compounds which might be used as biofuels of the future. 1. The main image shows a range of sweets (and we are still sad about having had to throw them away after the photo to avoid contamination) made from sugar, and a similarly random arrangement of laboratory glassware. As discussed in previous posts, round-bottomed flasks are often used to carry out chemical reactions when a heating mantle and stirring is needed, while beakers, conical flasks and test tubes can be used to hold liquids and solids for many experiments. 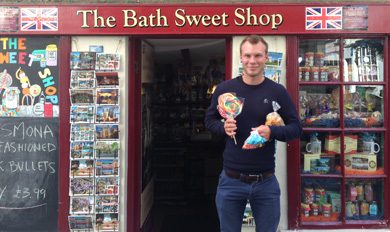 Although the sweets used in the photos had to be thrown away, we bought spares, and we have been eating a lot of sugar whilst writing these posts. The reactions occurring within our brains as we finish off that last piece of cake have been shown to have similarities with the chemistry of addiction to drugs such as morphine and heroin (Obes. Res. 2002, 10, 478-488) – see last year’s post on the opium poppy for details of their structures. Indeed, the likely addictive properties of sugar, combined with modern diets high in both natural and synthetic sweeteners, has placed sugar at the heart of the global debate over rising levels of chronic diseases such as obesity and diabetes. In March 2014 the World Health Organisation halved its guideline for sugar consumption to 5% of daily calorie intake, a step expected to cause problems for the food industry (Nature 2014, 507, 150). Another recent controversy is also related to sugars – the conversion of sugar cane and corn starch into bioethanol (Wikipedia gives a useful overview). This is currently mostly achieved by fermentation, and concerns have been raised about using arable land for the production of fuel instead of food, as well as about the energy costs for the transport and production of biofuels. An interesting aspect of this debate is the assessment of the energy balance of different sources of bioethanol (see for example this article in National Geographic from October 2007), which makes the sugar cane discussed in our previous post on sugars much more attractive than corn. The production of biofuels from lignin and cellulose has been discussed in greater detail in our post on perennial grass (Miscanthus). Sugars have attracted more positive media attention when used in the treatment of severe deep tissue injuries, where improvements in healing rates have been recorded following application of sucrose to patients’ wounds. In these cases, the affordability and antiseptic properties of sugar make it an attractive alternative to modern treatments. Scheme 1. Decomposition of sucrose at high temperature. Scheme 2: Enantiomers for a single chiral carbon centre. For each chiral carbon, there are two possible ways of arranging these four substituents in three-dimensions, giving rise to non-superimposable mirror images, also called enantiomers (Scheme 2). If there are several chiral centres present in a molecule (and taxol is a rather impressive example), then a range of different combinations of chiral centres are possible, giving both enantiomers and diastereomers – enantiomers are non-superimposable mirror images of each other, while diastereomers are not. If not in a chiral environment, enantiomers have the same physical and chemical properties, whereas they interact in different ways with other chiral molecules; in contrast, diastereomers have different properties regardless of the environment. Molecules can alter the rotation of plane polarised light, a phenomenon called optical activity. Enantiomerically enriched solutions show detectable optical rotation, and the extent of rotation relates to the purity of the solution, while the direction of rotation shows which enantiomer is the dominant one. Sucrose and glucose turn the plane of polarised light to the right, while fructose turns it to the left. Each of these molecules turns by a different amount (called the specific rotation), and as sucrose is converted to the monosaccharides, the optical rotation of the mixture changes from rotating the plane of polarised light to the right to rotating it to the left, allowing the progress of this reaction to be monitored and giving rise to its name: inverted sugar syrup. This tastes sweeter and has improved processing properties. Follow this link for a demonstration of this inversion on the pages of the Royal Society of Chemistry. 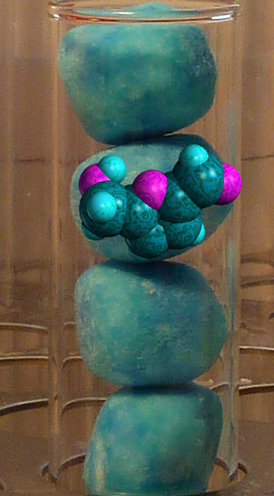 Sweets in a large test tube, and a molecule of HMF. 3. The complex chemistry of caramel begins as the temperature continues to rise above 100 oC, leading to thousands of reaction products (J. Agric. Food Chem. 2012, 60, 3266-3274). The main compounds produced during caramelisation are diacetyl, which gives caramel its buttery taste, and furans such as 5-hydroxymethylfurfural (HMF), produced from the dehydration of carbohydrates and subsequent isomerisation of glucose to fructose. This isomerisation is known as the Lobry de Bruyn-van Ekenstein transformation (Scheme 3), which has been identified as the rate-determining, i.e. 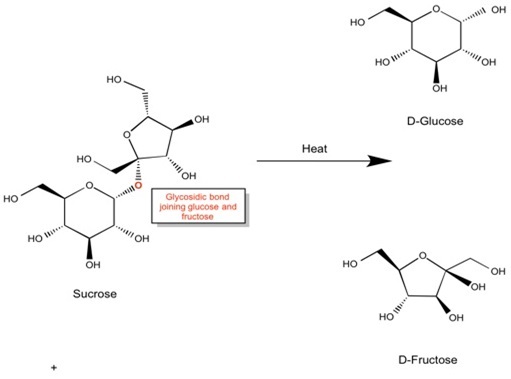 the slowest, step in the conversion of glucose to HMF (Green Chem., 2011,13, 754-793). Mainly found in baked and caramelised food but also present in honey, HMF was first synthesised in 1895 by heating sucrose with an acid catalyst under pressure. HMF is an important platform chemical in the production of biofuels (Green Chem., 2011,13, 754-793) and can be obtained directly from lignocellulosic biomass by the breakdown of cellulose, a polymer of glucose. This process is often achieved by enzymes or use of mineral-acid catalysts such as sulfuric acid. HMF can be upgraded to 2,5-dimethylfuran (DMF) with a metal catalyst via hydrogenolysis of carbon-oxygen bonds (see this link for a summary review). Metal-catalysed hydrogenation is also possible (Catalysis Today, 2014, 232, 89-98). DMF is a potential liquid biofuel with an energy density 40% greater than bioethanol, which, alongside biodiesel, is currently the main compound being produced for green energy. However, large-scale hydrogenolysis raises environmental concerns as most hydrogen is currently produced from petroleum sources. As a result, routes to sugar-derived liquid biofuels via an HMF intermediate continue to be explored. 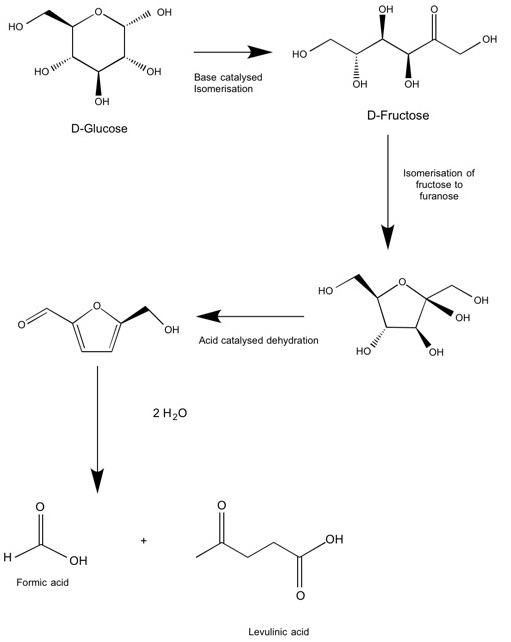 Synthesis of HMF in aqueous solution via the dehydration of fructose is another affordable route (Scheme 4), but poses several challenges due to the instability of HMF in water. Problems include polymerisation and the formation of unwanted by-products including oligomers, insoluble molecules called humins, as well as formic and levulinic acid, which are included in Scheme 4. Despite this, use of a ‘one-pot’ synthesis in aqueous media at low glucose concentrations, utilising the catalytic acid-base properties of sulfated zirconia nanoparticles, enabled successful transformation of glucose into fructose and subsequent dehydration to HMF (Catal. Sci. Technol. 2014, 4, 333-342). A high conversion and yield were obtained, although at higher glucose concentrations the probability of unwanted by-products is likely to increase. 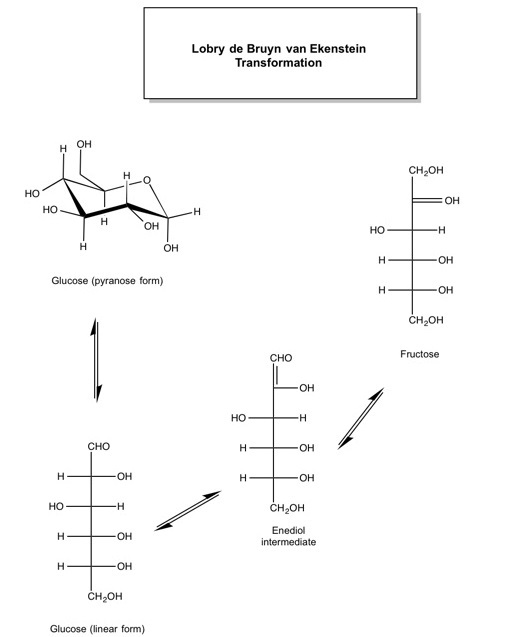 * Note that both glucose and fructose can also adopt other ring and linear conformations, the latter with fewer chiral centres, but favour ring structures in aqueous solutions. Categories: Alcohol, Chirality, Cookery, Food, Fuel, Medicine, sugar, Synthesis | Tags: biofuel, biomass, carbohydrate, chemistry, chirality, cooking, food, fructose, fuel, glucose, medicine, polymer, science, sucrose, sugar, sugar cane | Permalink.